Allied Security provide all types of wired and wire free alarm system including Intrusion, Panic / Hold-Up and Fire alarm systems. The systems we install are of the highest specification utilising household trusted brands like Bosch, Samsung and Honeywell, these high quality makes have been chosen to provide exceptional reliability and good value for money. The most common type of alarm we install are Intrusion Alarms providing protection via internal movement detection sensors. We can also install detectors that monitor if doors are opened and vibration detectors that will activate the alarm if a window or door is attacked before an intruder gains entry. Smoke and Carbon Dioxide detectors can be added to the system to provide complete peace of mind. Please click on the Tabs below to view relevant information on the different alarm devices available. We have field tested most makes of alarm detectors over the years and have always found that the Bosch detectors provide the best reliability and value for money. The standard Bosch Passive Infrared detectors are normally installed to our commercial premises as these sensors provide fast detection of intruders with good reliability in a normal office environment. If detectors are to be installed in to warehouse areas or the customer requires the utmost reliability we recommend the Bosch Triple Technology detectors, these detectors provide outstanding reliability in normal or harsh environments these detectors will not be activated by drafts or rodents. due to intelligent processing software that ignores one or more animals up to a combined weight of up to 50Kg. 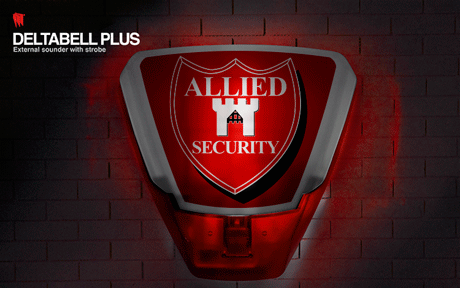 Allied Security alarm systems have the ability to utilise wire free alarm detectors if required by the customer. Wire free detectors can be installed throughout the premises or just to locations where it is difficult to install wired detectors like outbuildings. We are able to install wire free standard and dual technology movement detectors, door opening, door and window vibration detectors and even wire free smoke detectors. In addition wire free remote control key fobs with inbuilt panic alarm button can be added to the system to allow the system to be turned on and off without going to the control keypad. The panic button requires two buttons to be pressed together to activate the alarm sounders and can be used inside or outside the premises. We install the Award Winning Euro alarm control systems. We have been installing this systems for over twenty years and the control system has won many industry awards for design and features including the European Security Industry Innovation Award. The reason we install this systems is because of the high reliability and the exceptionally simple user interface. When a customer wants to turn on the alarm when they leave the premises all the users has to do is enter a four digit code or present an digital key (key fob/ tag) to the keypad. All of our alarm systems have at least one internal sounder and one very loud external sounder to ensure as much attention is drawn to your premises if the alarm is activated by an intruder. We also install one dummy external sounder at the rear of the premises to let burglars know that your building is protected if they approach from the rear. A second illuminated sounder can be install to the back of the property if there is a high risk of attack from the rear. Our wired external sounders have night time illumination to ensure that burglars can clearly identify that your premises has a alarm system and that it is fully operational. Our wire free external sounders have the night time illumination deactivated as they are powered by batteries although wired external sounders can be installed to wire free systems if customers require a night time illuminated external sounder. Our external sounders conform to Local Environmental Health Noise Nuisance Regulations and will activate for a maximum period of 15 minutes. If an intruder is still within the premises or re-enters after the sounder has switched off the sounder will reactivate for another 15 minutes. Many of our customers believe there is no point in installing an alarm system that only activates internal and external sounders that are often ignored by their neighbours. The SD2 SMS Text & Speech Dialler can be added to all of our systems to inform customers, friends and family members that the alarm at the premises has been activated. This system can not be used to inform the Police, but does not have the high annual charges incurred by a monitored / Police response alarm system, as the customer will only pay the one off cost for the dialling system to be installed plus the cost of any telephone calls or SMS Text messages that are sent directly to their contacts. The SD2 provides the ability to contact up to 10 different people / phone numbers and inform them of an alarm activation via a voice message or SMS text message. The Speech Dialler can be configured to inform up to four different types of alarm activations that occur at the premises including Intrusion, Panic / Hold-Up, Fire Alarm, Medical Assistance, Power Failure and Water Leaks, if these types of detectors have been installed. All of our systems can be connected to the 24-hour alarm receiving centre that will monitor the alarm system and dispatch the Emergency Services directly to the premises when an alarm activation occurs. If the customer requires Police response to intrusion alarm activations the system will be configured to meet the strict Police requirements to prevent false alarms being passed to the Police. All of Allied Security systems are installed to the latest British Standard (BS8243:2010) for remotely monitored Police response systems. If panic buttons have been installed a high priority alarm will be passed to the Police and the Police will immediately send an officer to the premises, the system can also automatically dispatch the Fire Brigade to the premises if a smoke detector has been activated. The system will also inform the customer or key holders if a power failure occurs at the premises protecting power sensitive equipment, computer servers and contents of fridge freezers. Allied Security install the BT RedCARE alarm monitoring system as standard which is requested by many insurance companies for commercial premises. The RedCARE system provides a dual path connection to the monitoring centre. The first connection path is by the mobile phone network, the RedCARE will lock on to the strongest mobile network signal, if that signal is lost or drops the RedCARE will automatically switch to next mobile network with the strongest signal. As an emergency back up the RedCARE is also connected to the customers landline telephone and will pass alarm activations to the monitoring centre if all mobile phone networks fail at the same time. The dual path system ensures that any alarm occurring at your business is always passed to the emergency services even if burglars have disabled the telephone line. The BT RedCARE monitoring system has no expensive hidden charges unlike some systems and our All Inclusive maintenance and monitoring contract includes all mobile phone rental and call charges that are made by the system.